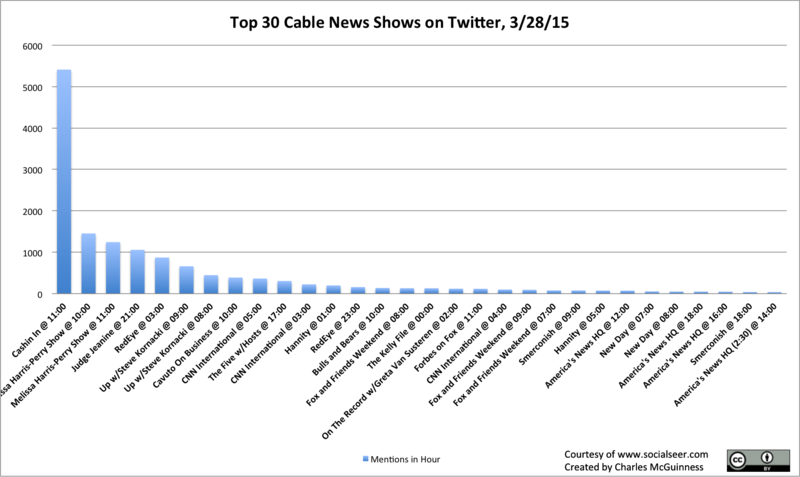 The Melissa Harris-Perry Show won the best hour in Cable News Twitter on Sunday, while CNN International had the best day overall. The spike for Cashin’ In speaks for itself, but I’ll point out that during the 11 am hour (Cashin’ In runs from 11:30 to noon), Cashin’ got more mentions – just in that one hour – than Melissa Harris-Perry and Up with Kornacki got, combined, through the entire 24 hours of Saturday. Those two shows had 5405 mentions total for the entire day, while Cashin’ had 5411 mentions in just the 11am hour. Now Hillary is just trolling the GOP on emails. To avoid prolonging a discussion that would be academic, I have confirmed with the secretary’s IT support that no emails…..for the time period January 21, 2009 through February 1, 2013 reside on the server or on any back-up systems associated with the server. That won’t stop people from trying to find a way to still recover those emails, but let me offer a word of advice: it’s not going to happen and you’re getting played here.